Several months ago, while standing in line at Whole Foods, I started reading the print on the side of one very famous red, black and white bag printed up by an even more famous yoga attire company and I read these words: "Sunscreen absorbed into the skin might be worse for you than sunshine" . What!? At first blush I was shocked, and then furious. Was this a responsible message without more context? I didn't think so, but i also didn't know enough to know just how irresponsible this message was. As someone that works outside for a living I have to use sunscreen daily. Was I doing more harm than good? Unsure, I turned to my gal Shelly Belinko, who is the most credible person I know on the topic of natural beauty products. Her company, Blinking Owl Acres, is a makeup and body skin care company that is uncompromising when it comes to transparency on what goes into their products. Shelly is the first to point out that the natural beauty industry is full of fear mongering on one side, and so much "green washing" on the other. Shelly offered to write a blog educating all of us on the sunshine vs. sunscreen debate, and settles once and for all what to use on your skin to protect it from excessive sun exposure while also keeping you safe. What follows Shelly breaking down the debate and sharing her best tips for choosing a safe sunscreen! The best way to navigate sun exposure is to find balance. A holistic approach to anything requires consideration of the whole system rather than small aspects taken out of context. Sun exposure triggers your body to produce essential Vitamin D, and hormones like melatonin which regulate restful sleep and good moods. 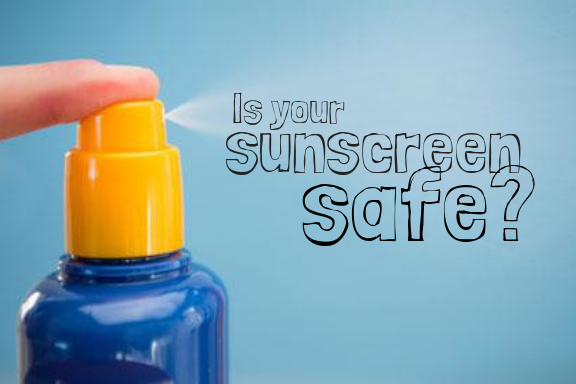 Yet too much unprotected sun exposure causes sunburns, accelerates aging, and may trigger development of skin cancer. Finding the sweet spot becomes easy if you know a bit more about sunlight and sun protection. UVA rays, the ones that make up 95% of UV radiation, are present during all daylight hours, and all seasons. They penetrate cloud cover and they penetrate glass. They also penetrate our skin’s protective layer and reach deep down affecting collagen production and triggering wrinkles and fine lines. If you want to remember the difference, you can think of the A in UVA for AGE and the B in UVB for BURN. However, I believe that in modern western society, sun exposure is demonized somewhat excessively and the beautiful healing energy of the sun is not addressed enough. For example, while it is true that UV exposure could cause skin cancer, it has also been found that Vitamin D triggered by an appropriate amount of sun exposure actually reduces incidences of other forms of cancer! And, countless studies have confirmed what we instinctively know to be true: sunlight makes us happier and more productive. It fills us with life energy and calibrates our bodies’ circadian rhythms. Now, how do we find that balance between healthy sun exposure and proper sun protection? First, not all times of day are equal. Early morning (pre 9am) sun exposure is great. If you have the time to step out into the early morning sunshine for 15-30 minutes without sunscreen, you will jumpstart your body’s systems and be on track for hormone and Vitamin D production. Optimally, you want to stay away from direct 10am-4pm sun, although for those of us working outside, this is not always possible. Furthermore, even those of us working inside or driving during those times, might be inadvertently getting UVA exposure. Remember, UVA (aging) rays penetrate glass – so they go right through your windshield and mess with your skin’s youthful glow and elasticity. Thankfully, your youthful beauty is easily protected if you use the right type of sunscreen. I recommend that everyone apply sunscreen to face, neck, chest and backs of hands daily to prevent dark spots and easily fight those early signs of aging. For those of us working in more exposed conditions, you probably want to apply to other exposed areas (shoulders, etc). SPF is only a measurement of how well sunscreen protects you from sunburn! This means it is only referring to UVB rays! SPF15 filters out approximately 93% of incoming UVB rays, SPF 30 filters up to 97% and SPF 50 keeps out 98% of incoming UVB rays. These will all keep you from burning in the sun longer, but will not necessarily protect you from the more penetrating and less noticeable UVA rays. “Broad Spectrum” means that the sunscreen protects from both UVA and UVB rays. Always get broad spectrum sunscreen! Physical sunscreens are the natural mineral sunscreens: zinc oxide and titanium dioxide. They are both broad spectrum, although zinc oxide provides more protection against UVA than titanium dioxide. They are much gentler on skin and better for the environment. The cons are that they must be reapplied to physically maintain a barrier on your skin, and that unless they are nano-sized particles, they will leave a whitish tint on your skin. Chemical sunscreens contain active ingredients such as oxybenzone, octinoxate, etc. They absorb UV rays into the skin and convert them into heat. They can cause brown spots or discoloration due to high skin temperatures and may cause irritation to sensitive skin, however, the big draw of these sunscreens seems to be that they tend to be lighter weight and transparent. Beware of tricky labeling! I have seen sunscreen labeled “ZINC OXIDE SUNSCREEN” in huge letters, and then the active ingredients were chemical sunscreens, not zinc oxide! I personally use and recommend zinc oxide sunscreens. The weight and stickiness of the sunscreen will vary depending on the base it is in, so if you don’t like sticky sunscreens, try one with lighter oils, or less beeswax. For the face, my mineral makeup contains zinc oxide so it works double duty to protect my skin. Shelly Belinko is the owner and founder of Blinking Owl Acres, and the smartest person we know on all things natural beauty! Comb honey is one of nature’s wonders. In another blog, I gushed over why I love it so, and I thought I’d share some of my favorite ways to eat it! You can use comb honey in any way that you’d use honey from a jar. However, comb honey is a very special product (yes, far more special than the jarred honey you are likely used to), so particular care should be taken to ensure any recipe highlights the special attributes of this culinary marvel. I’ve given you some ideas below, and they are listed from the more obvious and common to the more adventurous. Keep in mind that a little comb honey goes a long way. Theres a lot more honey in those hexagons that you probably think. This one is courtesy of the fabulous team from Academia in downtown Austin. My cheese plate only look like this in my dreams. No longer will dairy be the main event on your cheese plate: move over brie and munster, comb honey is here to steal your thunder. Pair with plain or candied nuts, a variety of cheeses and crackers, and even some jams and preserves for a delightful ‘choose your own culinary’ adventure for your guests. You’ll never look at bread the same way again once you pair it with comb honey. The key here is ensure your glutenous canvas is really hot. Whether you choose toast, a biscuit, or, a personal favorite, cornbread, a really hot base will ensure the comb honey melts into the crevices of your bread. No need for butter here! Comb honey also makes a great addition to a waffle and pancake bar! Shake up your breakfast by adding a bit of comb honey atop your yogurt or oatmeal. I’m personally not a big oatmeal fan, but every day for over a year my breakfast of champions has been a cup of greek yogurt, cacao nibs or spiced pecans, berries, and a dollop of comb honey. My daily breakfast. Its as delicious as it is gorgeous. This is how I gained my winter ‘coat’ in the cold ’17-’18 Austin winter. (It snowed--twice!) Take two pieces of bread and make a traditional peanut butter and jelly sandwich, but leave out the jelly, and instead add a few small bits of comb honey. I then like to place the sandwich in a pan with a bit of butter, flipping it over a time or two to ensure it gets evenly toasted. The heat from the pan will make sure that peanut butter, honey, and wax melt together, and then melt in your mouth. This one is the newest to me, but combining comb honey in more savory meals is becoming my favorite way to experiment. Lately I’ve been topping arugula with a salty pecorino, a few pecans and apples, a bit of olive oil, freshly ground pepper, and a few dollops of comb honey. This one I discovered while at a ‘make your own’ pizza party last spring. I’d just started the spring 2017 harvest, and I brought a square from the very first frame harvested for the year to share with new friends. We got creative, and it paid off. We found that a combination of goat cheese, figs, arugula, topped with small bits of comb honey made for one of the most amazing pizzas we’d had. Of course, we also had the benefit of an outdoor Italian pizza oven, but I am pretty sure your results would be pretty stellar in a regular home oven too! Of course, sometimes the best way is the simplest way. If you find yourself worrying with how to eat your comb honey, you’re thinking too hard. If I’m speaking honestly, my favorite way to eat comb honey is with a spoon! Apples? Uh uh. A spoonful of comb honey per day keeps the doctor away. I’d love to hear your own ideas and favorite ways of how to eat comb honey. Please share them in the comments below, and maybe your ideas will make it in the next blog! Need more comb honey to test new recipes? Shop here! Comb honey, in simplest terms, is the rawest form of honey available. The worker bee “architects” build tiny beeswax hexagons to give their young a place to develop and grow, to allow for the storage of pollen and nectar, and of course, a place to house the honey they produce. When you buy a jar of honey, the beekeeper has either crushed the comb to squeeze out the honey or used a centrifuge to sling the honey from the wax. The honey is then filtered and placed in jars. Comb honey skips all those steps: we take the frames whose hexagons are filled only with honey, cut that comb honey into squares, and place it in a box for you to take home. No human hands have come into contact with your honey. Comb honey is raw honey packaged in its own edible package! A century ago, comb honey was a very common product. In fact, it was more common to find comb honey than it was to find jars of honey. These days the only beekeepers that generally produce comb honey are small-scale or hobbyist beekeepers. Why? Comb honey does take a bit more nuance and patience to produce. Also, a beekeeper that uses a centrifuge to jar honey will reuse the wax hexagons after the honey is removed, which allows them to produce more honey much more quickly. Comb honey is a gorgeous natural wonder: tens of thousands of bees working together to build perfect hexagons that are the exact same size and shape that fit perfectly together over and over again. Because the bees make each of these hexagon containers with their own ‘lid’, which we leave intact when we cut comb honey, comb honey has been filtered..not even a little bit. In fact, the honey hasn’t come into contact with human hands or any artificial matter. That means all the anti-microbial and healthy properties from the pollen, propolis, enzymes make it to your breakfast table. This is comb honey before the bees put the 'lid' on! Once the honey is capped, we beekeepers know the honey has cured and can be harvested. Of course, we only harvest after we have ensured the bees have enough to feed themselves. Comb honey is a much more exciting and interesting culinary experience. The beeswax makes comb honey more aromatic than jarred honey, and the smell, taste, and even consistency differs depending on the flowers the bees visited to produce the beeswax and honey. In addition to the aroma, the beeswax lends a texture, richness, and mouthfeel that regular old honey just can’t match. (Trust me. I’m a professional honey-eater.) It holds its shape, so instead of just getting watered down into your morning yogurt, it acts as more of a delicious, beautiful sweet garnish, instead of just a generic sweetener. What is this beeswax stuff, and can you actually eat it? Beeswax is completely safe for you to eat. When eating comb honey by itself, you will be left with a bit of wax in your mouth. You can spit it out, chew it like chewing gum, or swallow it. Many folks don’t like this waxy feeling in their mouth. If you are one of these, I strongly encourage you to not give up on comb honey so quickly. When consumed in conjunction with other food (for example, on a cracker with a bit of goat cheese, or with some yogurt or oatmeal), you aren’t left with any sort of wax in your mouth after! Got the basics down? Now spread the comb honey on a really hot biscuit, make a few grilled peanut butter and comb honey sandwiches, or bake a pizza with goat cheese, arugula, and comb honey, and prepare to be wowed. Now that you know the skinny on comb honey, check out this for some fun ideas for comb honey recipes! A note about “cone” honey. I am not sure how the trend of calling comb honey “cone honey” started, but I am here to set the record straight. It’s called COMB honey! Every time someone says ‘cone honey’, a tiny bee dies somewhere. And my mind goes here. Ready to try? Shop for honey here! Don't Forget to Water the Bees! Providing a water source for your bees is pretty easy, and can be as simple as a chicken feeder. In this month’s column, I lay out a few considerations and a few fun ideas for unique bee waterin’ holes I’ve seen. One of my beekeepers built a feeder out of this unique planter basket, adding a bowl and stones for a really pretty addition to her backyard apiary. During the summer months, a blanket of mosquitos ascends on us here in Austin, along with a cloud of oppressive humidity. Ensure you aren’t perpetuating the problem with your chosen water source because if not thought out, you may be engaging in a mosquito breeding program right in your own back yard. (And with the latest concerns about Zika, this is one more way to make enemies with your neighbors.) To really understand how to control for mosquito laying and larvae, it’s important to learn a bit about the life cycle and needs of developing mosquitos at each stage. Adult mosquitos can lay in as little as one ounce of standing water, but they prefer water that is less than 24 inches deep. Also, stagnation in the water is required for breeding, and they prefer organic debris and vegetation that provides food and shelter for the larvae. To help prevent mosquitos from laying and larvae from thriving, you can choose deep water features (being sure to keep it topped off) and/or make sure the water is never stagnant. This requires some instrument or method to ensure constant slight movement in the water. You can purchase relatively inexpensive battery or solar-powered water “wigglers” or bubblers to prevent stagnant water. Also, avoid organic materials in the feature to avoid providing a food and shelter for larvae. Of course, if your water vessel is big enough, simply adding a few fish to feed on the larvae can solve this problem as well. Finally, you can buy doughnut shaped objects sold under names such as Mosquito Dunks and Mosquito Bits that claim to kill mosquito larvae. My research has found that these larvicides are actually safe to use, because the bacteria only affects larvae once ingested and won’t harm your adult bees. I’ve been told young children can drown in 2 inches of water, and applying this same principal to bees means that bees can drown in just a few millimeters of water. When a bee starts to drown, others will lend a helping hand (leg?) and this can set off a chain of drowning bees. Fortunately, it’s easy to prevent this kind of bee massacre. Stones in your water source work well, but keep in mind if it rains and the stones aren’t large enough to reach the surface of the vessel, bees can drown while their landing pads are under water. Corks are my preferred method, because they float. But again, after a big rain your floats can wash right out of the vessel. One of my beekeepers cut a cylindrical slab of wood to float on a bucket of water, and drilled holes in the float to ensure that rain can’t wash the float out as the bucket overflows. Here in Texas, a decent sized container of water can evaporate pretty quickly. If you don’t want to have to fill your container daily, choose a larger vessel. Also, don’t be too concerned with changing the water out weekly, as my experience is that bees actually prefer water sources that are a bit dirtier. I think ‘dirty’ water may contain more minerals that is attractive to the bees. So what makes a good water source? You’re only limited by your imagination, but I’ve seen bird baths, water troughs, paint buckets, chicken feeders, and even kids swimming pools. If aesthetics are important, a quick search of ‘water feature’ on pinterest will be a never-ending source of elaborate and gorgeous ideas you can adapt for your bees. Because really, nothing is too fancy for our bees, right?! This blog first appeared in the Kelley Beekeeping monthly newsletter. Founder and owner, Tara Chapman, is a regular contributor. You’ve got your equipment, and decided on your hive type, and now you just need bees! Believe it or not, many beekeepers breed bees just to help supply hobbyists with the opportunity to become beekeepers! Today I will lay out your options, and the pros and cons of each. A package of bees is a screened box that includes approximately 10,000 worker bees (give or take a few). Think of a package as a sort of swarm in a box. Beekeepers go out to their strongest hives and literally shake bees from those hives into these boxes. They are sold in 3 pound increments, and each is given a newly mated queen. The queen will come in a separate tiny screened box called a queen cage. Because these bees come from many different hives with existing queens, they need some time to accept the newly-provided queen. This queen cage allows them access to her pheromones but provide her protection from these bees that would otherwise be inclined to kill her. Once you buy a package, they need to be installed into your hives as soon as possible, and no more than a day or two after you pick them up. You install a package by shaking the bees into your own hive woodenware and hanging your queen between two frames. Look at Jackie and how excited she is about her two new package of bees! A nucleus hive, or “nuc”, is a tiny version of a regular hive. You generally receive 5 frames of various stages of brood (developing bees), worker bees, a laying queen, and honey in a cardboard or plastic box. The beekeeper has made a split, or increase, off of their existing hives by pulling 4 frames of brood and one frame of honey and given this mini hive a new queen, using the same queen cage method described above. You install this into your own woodenware by simply lifting the frames out of the nuc box and placing them into your own hive bodies. Presuming your nuc box is ventilated and has an entrance, you don’t need to install the nuc into your hive right away. Place the nuc in the same spot as your hive and open the entrance, allowing the bees to start to orient themselves to their new home and begin foraging for food. Particularly if the bees are on a nectar flow, they may run out of space in the nuc very quickly, so be sure to install within a week of pickup. Theoretically, a nuc hive puts you a bit ahead of the game. The nuc already has 5 drawn out frames of brood and stored honey, whereas the bees in the package are starting from scratch. That being said, I generally encourage brand new beekeepers to start hives off of packages at least once. Watching a box of bees make a home of out nothing is quite a sight. Also, nucs tend to be much more expensive. Finally, keep in mind if you buy a nuc that you have to ensure you have the right size hive body to fit the nuc frames. Almost all beekeepers sell deep size nucs, though a few sell medium size nucs. Here at Two Hives we run all medium brood boxes in our hives because I like the interchangeability of only running one hive body size, so all of our nucs are mediums. There is a third option, and the one that sounds the most appealing. “Free bees” entails catching a swarm or doing a live hive removal of a wild hive. However, I don’t recommend these options for beginners for a few reasons. First, you aren’t guaranteed to come across either, and if you have your heart set on keeping bees you are better served ordering bees to guarantee you can start a hive. Second, while swarm catching is pretty simple, it does require basic understanding of how a colony functions and you will be much better at swarm catching after a year of tending bees under your belt. A lot can go wrong very quickly with hive removals, so I’d leave this one to the professionals for now. Finally, unless you live in Europe, Asia, or Africa, honey bees are not native to your area. Therefore, I always recommend folks try to find a queen bee breeder in your region to ensure the bees are adapted to your climate. Second, I also generally recommend you research your options carefully to learn a bit more about what practices they employ, such as what treatments or antibiotics they use, and ensure they select for hygienic behavior and gentle temperament. I also get a lot of questions about what sub-species to look for, such as Italian or Russian honey bees. Rather than looking for these particular-sub species, Id focus on the breeder’s practices and ability to select for ideal traits. Would you like to get 5 years of beekeeping experience in just 6 Saturdays? If so, check out our Beek Apprenticeship. Our inaugural class was afforded the opportunity to do two live cut-outs of established hives! Beekeepers are a sturdy bunch. Not surprisingly, it seems dealing with tens of thousands of stinging insects attracts a hardy bunch of folks! Even still, we all have our limitations. Whether we are battling a physical constraint or just working on improving our physical ability and stamina, a few tips and tricks can go a long way. In this month's column, I will provide you some of my best practices for lessening the load we beekeepers have to carry. 1. Using 1-2 deeps cuts down on the number of total boxes required. This is true, but given that a medium frame of honey weighs 4 pounds and a deep frame weighs 6-7 pounds,I’lll go through the effort of moving an extra box. Of course, there may be a slight additional cost involved, but I’ll take a healthy back over saving a few bucks. 2. You will never have to move the brood box, and it will never be full of honey. As much as we like to argue what will and will not happen in a hive, the bees will decide to do what they will do. Plus, if you flip brood boxes when you come out of winter or ever plan to clean or replace your bottom board, you will need to move that bottom box. 1. The most weight you will be required to move at one time is 35-40 pounds. A deep full of honey will weigh up to 70 pounds. 2. Shoulder strain is real. Don’t underestimate the strain on your shoulders by simply holding those heavier deep frames. I use all mediums, and when I inspect my clients’ deep frames, the weight is significantly more taxing on my upper body. 3. Imagine a world of complete interchangeability between all your hives! No more realizing you brought deep frames when you actually needed mediums, and vice versa. Plus, if you elect to do 8 frame boxes, then you are again decreasing the maximum weight of each box. Of course, another obvious solution is to just use a top bar, and then you eliminate all stooping and bending in general. However, although I started on top bars, I much prefer my foundation-less langstroth frames and I don’t like telling someone their only option is a top bar! I personally don’t find the lifting involved in beekeeping particularly taxing outside of the harvest season, which is a very short period of the year. However, I do find stooping over hives and a day full of bending at the waist to look inside langstroth hives really does a number on my back the next day. If you find this equally as stressful on your lumbar spine, consider bringing a small stool. Although I don’t usually advocate for more sitting (generally we do far too much of that in our society! ), this will allow you to inspect your bottom-most boxes more easily while acting as a back saver. Anna Gieselman, of Bee Amour Jewelry in Austin, uses a cinder block as a stool to aid in keeping her back in good shape during inspections! I would also recommend you elevate your hives at least 6 inches off the ground. Not only does this help with ventilation and deter certain predators such as possums and skunks, it puts your hive a little bit closer to your center of gravity. However, refrain from elevating your hives too high. Depending on how tall you are, you want to keep in mind that you will be adding supers during a nectar flow and you don’t want to get in a position where you are having to lift 40 pound supers over your head. I’d set up your hive with as many boxes as you would expect to have during a strong flow, and play around with the height a bit to make sure it is manageable. I invested in a sturdy utility cart this year, and I am really excited at what it will do for me come harvesting time. Most of my hives are urban, so I don’t have the benefit of driving the truck right up to the hive and my boxes have to be carried 20-50 yards. Look for one with large heavy duty wheels if you expect to have to pull it over rough terrain. Also look for one whose sides can drop down to act as a flat bed cart if the need arises. Use an entrance reducer as a sort of wedge to help as you remove upper hive bodies. Some of my beekeepers have a hard time removing the top super or brood box in a langstroth hive, not just because of weight, but because once you use your tool to break the propolis seal on one side of the box, it can take some hand trickery to keep that side of the box elevated while you switch your hand grip to lift. If you find this challenging, use a wedge of some sort (an entrance reducer works perfectly!) in between the two boxes. This will keep the seal broken and the side of the box elevated while you readjust your grip. If you like to break the seal on both sides of the box before you lift, then simply use the same technique on the opposite side with another entrance reducer. Also, I find that the last 12 inches of setting those supers on the ground is the most opportune time for an injury. Rather than setting them on the ground, set it on the hive next door if you have one. Keep in mind you want to make sure the cover is on the hive first. You’d never want to set a hive body on another open hive. 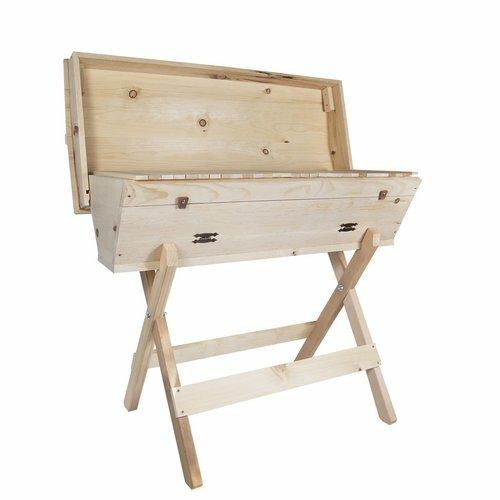 If you don’t have a hive nearby that makes this practical, install something that can act as a sort of small stand or table next to the hive that allows you to set the hive bodies between knee and waist height. Using 8 frame mediums and still having an issue lifting? Bring an empty hive body into the apiary, and remove a few of the frames into the empty box before lifting the hive body. Just moving 2 frames will take up to 8 pounds off the total weight. Also, remember not every inspection requires you inspect every frame. In fact, I very rarely look at every frame in a hive, unless I am requeening and she’s playing hard to get. If you have 6 hives and pull only 4 frames from each hive instead of 10 or more per hive, you are saving your shoulders a lot of extra work. Remember what your momma told you. The basics of course apply here. Lift with your legs, not your back. What this means, in case you never paid attention in gym glass, is you don’t want to bend at the waist but rather you want to push your knees out and squat down before lifting. This takes the strain out of your back and puts in on your glutes and legs, where it belongs. Also be sure to engage your abdominal muscles when you lift. Staying active outside of the bee yard and lifting weights will go a long way to preserving your ability to keep bees well into your golden years. Olympic lifting is a favorite past time of mine, and it makes my daily work easier and helps ensure an injury-free work zone. If you have small hands and you have a hard time managing your hive tool, try out a few of the ‘fancy’ tools out on the market. Look for a tool that is more narrow and longer than the traditional tool for easier handling and more leverage. A J-hook hive tool has a hook that helps to pry frames out of a hive. Personally, I prefer the traditional old-school hive tool and perhaps with a few tips it may work just fine for you as well: I find that I really only need the first three fingers on each hand to move frames and even lift boxes, which means my ring finger and pinky are free to hold the tool in the palm of my hand. This means I don’t have to keep setting my tool down to work, and am not spending a lot of time trying to figure out where I put it! Using your first three fingers only also helps you remember to pinch the outer edge of your frames, rather than death gripping underneath the end of the frame. If you are used to the latter, then you know how hard it is to get your hands out of the way when you are trying to insert that last frame in the hive. If you use the pinch technique, then you will have an easier time squeezing in that last frame. Keep your hive tool tucked under your last two digits to free your first three fingers for bee work. Hope these tips keep your back healthy and you keeping bees well into your golden years! This blog originally appeared in the monthly Kelley Bees Newsletter in my bi-monthly column "The Townie Bees". Subscribe at https://www.kelleybees.com. This or that? Choosing your hive type. One of the challenging aspects of starting a hobby as a beekeeper is you are required to make a number of important decisions when you know very little and have almost no, if any, beekeeping experience! One of those decisions is what time of hive you will keep. While there are several types of hives, the two most common in North America are the top bar hive and the langstroth. I started on top bars, but moved to langstroth in my second year of beekeeping. Langstroth hives are used by commercial beekeepers and most hobbyists, though top bars are becoming more popular. Beekeepers, both hobbyist and professional, tend to be very opinionated and strong willed about the ‘right’ way to keep bees, and like most things, I find that most folks tend to keep whatever type of hive they are first introduced to. Speaking (very) generally and probably unfairly stereotypically, folks that keep top bars think that the langstroth beekeepers clearly all treat with toxic chemicals and are single handedly responsibly for the decline of the honey bee population, while folks that keep langstroths think top bar beekeepers are hippies that don’t shave their legs and are overly idealistic. All of that is nonsense, and either type of hive has proven to work just fine, but it’s important you find one that works best for you! I’ve broken down some of the considerations below, and I hope it will help you make this decision. Some of the terms I use below may be new to you, but don’t fret. For now, just understanding how these considerations apply to your situation and determining your priorities in a hive is most important! This is where the top bar really shines, due to the lack of lifting and stooping required to work your bees. Because the bees build from the front of the hive to the back, and you don’t have any way to add additional space, top bars require no heavy lifting. Further, the hive is at waist level, so you can work comfortably standing straight up. You should be able to life 40 pounds if you decide to go the way of the langstroth. Keep in mind you won’t be lifting boxes that heavy year round, just during honey season! However, if lifting that amount even a few times a year will be challenging for you, consider choosing a top bar hive. BOTTOM LINE: If lifting and bending is an issue, choose a top bar. Got my mind on my honey and my honey on my mind. BOTTOM LINE: Langstroths can arguably produce more honey, but there are so many other factors involved in honey production (many out of your control), that you should mark this off your considerations list. Although it is now fairly simple to find a top bar hive manufacturer, not too many years ago if you wanted a top bar you had to build it yourself. However, because manufacturers are just now coming around to mass producing top bar hives, no industry standards exist for these hives. Whereas if you buy an 8 frame hive body from us, an 8 frame inner cover from another company, and an 8 frame bottom board from yet another producer, they will all fit together just fine! Once you select a top bar hive manufacturer, you maybe ‘stuck’ with buying any additional top bars from that same company. Of course, if you decide to build your own top bar and are ok continuing to fabricate additional hives and parts, this point doesn’t matter. Almost all accessories are also meant to be paired with a langstroth hive, though we don’t think most of these accessories are critical anyway. TIP: If you go the route of the langstroth, I strongly encourage you to use all medium hive bodies, rather than the ‘industry standard’ of starting with one or two deeps for your brood boxes and mediums for your honey supers. You’ll thank me when you reach for a frame and realize you don’t have to check twice to ensure you have the right size frame, because all of your frames take the same size! BOTTOM LINE: If standardization of equipment is critical, go with a langstroth, and choose medium hive bodies. Top bars do require a bit more maintenance, particularly early on. Personally, I can inspect a langstroth hive much more quickly than I can a top bar, because I can manipulate and handle the frames quicker and I don’t have to be as concerned about breaking comb. On the other hand, the beauty of a top bar is if you just need to pull a few combs, you expose and ‘disturb’ a much smaller portion of the nest with each frame you pull. If you are planning to run a large number of hives, then perhaps the time needed to inspect shoud be considered, but if you are just running a few hives this probably isn’t a concern. BOTTOM LINE: Langstroth require less work and time, but unless you are looking to become a sideliner professional beekeeper, this metric is negligible. Enjoy the time you get with your bees, and don’t look at is as a job. This category is a sort of toss up. 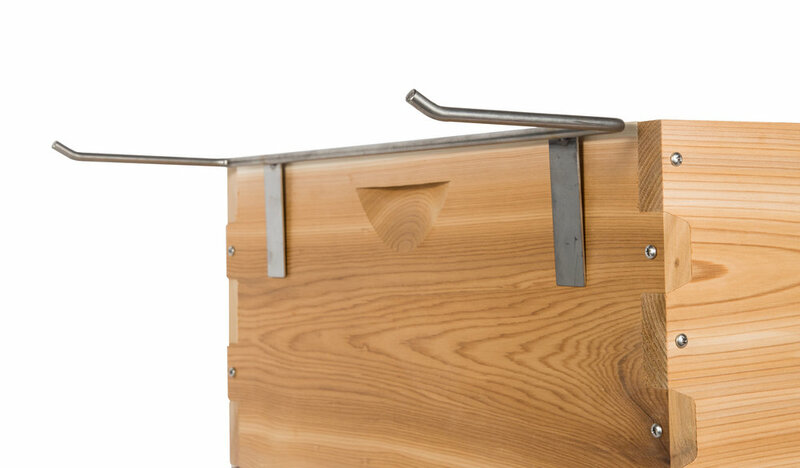 Top bar hives, when purchased from a third party, tend to be relatively more expensive. You can get a decent langstroth hive for under few hundred bucks, whereas top bars can run you over $400. (Word to the wise: there are a number of cheap langstroth hives on the market, but remember you get what you pay for. Look for hives made from materials that are longer lasting and that don’t require treatment or painting.) On the other hand, if you or someone you know is handy with a saw and nails, you can build your own top bar from reclaimed materials for pennies! Make sure you look for plans online, as proper spacing and size of your top bars is critical. BOTTOM LINE: If affordability is your priority, choose a langstroth made from long-lasting materials or build your own top bar from plans. A table summary of the two main types of hives. Questions? Don't hesitate to contact us! We are continuing our winter series of blogs to help you get started as a beekeeper next spring. Next month, look for a blog on choosing foundation type for your langstroth hive. You’ve ordered your bees, and you know it’s time to get all your tools, gear, and equipment! This is the fun part right? Who doesn’t love gadgets! You grab a beekeeping catalog, or perhaps peruse a few online beekeeping sites, and you suddenly have paralysis of the brain. How are there SO MANY tools, gadgets, bells, whistles?! Literally the marketplace has thousands of items you can buy pertaining to beekeeping. I remember selecting gear for my first hive, and it was enough to send me screaming for the hills. How are you ever supposed to wade through it all? Entrance reducer: One of the benefits our tended hives have, as opposed to those in the wild, is that we can increase and decrease both the size of the hive and the entrance. Entrance size is important because we can give a strong hive a larger entrance to prevent traffic jams in the busy foraging months, and we can decrease the entrance size when the hive is weaker and doesn’t have as many resources to defend the entrance. Also, reducers are recommended until a new hive becomes established and used again in the winter to decrease the cold winds into the hive. If you keep top bars, you can use cork plugs to decrease your number of entrances to the same affect. You will need one entrance reducer per hive. Tip: in a pinch most anything can be used as a reducer. At times I’ve realized I needed a reducer and have utilized a large stick, broken to the right size. Keep in mind anything you place at the entrance that the bees cannot remove will be propolized to the bottom board. Smoker: Your smoker is the pop to your tart. The peanut butter to your jelly. Never, and I mean never, inspect a hive without a lit smoker in your hand. If you’ve taken a class with me you know I don’t like to preach a certain philosophy of beekeeping, but this is one area where I stand firm. Cool smoke (look for another blog soon on how to light a smoker!) interferes with the defender bees’ communications systems, and it also provides a great tool to move bees away from an area so you can move without squishing bees. Inspecting a hive without a smoker is asking for trouble, and a smoker allows you to stay one step ahead of any forseen aggression. A good quality smoker will last for decades, but with frequent use you may need to change the bellows every few years. Some smokers have a cone shaped upper and some have a domed shaped upper. There's no real difference in functionality, just like a handbag, choose the one that goes best with your shoes. Hive tool: Consider this tool your third hand. Bees gather propolis, a microbial and extremely sticky substance from the sap of trees. They use this “bee glue” to seal up all crevices and holes in the hive, and they will glue all your woodenware parts together. Your hive tool is used like a crow bar to help pry open all the hive components. Never jerk a box or frame out of the box without loosening it with your tool first. Best case scenario, you are apt to break a wooden component (yes, this stuff is that strong!). Worst case, you may yank up a box and instead pull up the entire hive, which may break mid air, dropping a whole hive to the ground. A certain beekeeper I know that owns an awesome little honey company in Austin has done this a time or two when she was in a big rush and couldn’t find her hive tool…. Feeder: To feed or not to feed, that is the controversial question. While I like to show restraint and sound judgment in taking care to not supplemental feed bees when it’s not necessary, except to produce an intended result just for the benefit of us humans, a point in time will come when you have to feed your bees. Feeding a brand new hive is critical to help them build enough comb to become established, and often times the weather just doesn’t cooperate and feeding sugar water is necessary. You have lots of feeder options, and it’s important to find the one that best suits yours and your bees’ needs. We prefer to feed over an inner cover with an inverted jar or pail, or at the entrance with a boardman/entrance feeder from time to time. The beauty of purchasing a boardman/entrance feeder is that this one feeder gives you two configuration options. You can use the bottom feeding piece to feed at the entrance, or pitch it and just use the perforated lid to feed over an inner cover. A double jar feeder gives you twice the capacity of a regular entrance feeder. If you have multiple hives, you may want to buy or make a few different feeder options to decide what works best for you. You will need one feeding component per hive. Protective gear: The level of protective gear you select is a very personal decision, and needs to match your comfort level working bees. I always recommend at least one fuller coverage piece, which means either a full suit or a jacket and veil combination. While I rarely wear more than a veil, a time will come when you will need and want a piece with more coverage. Start with a more protective piece, and as your comfort level grows you can move to less gear. A tip for those of you in hotter climates: (Texans, are you listening?) I strongly recommend you consider ventilated gear. While it is heavier than typical cotton protective gear, it is significantly cooler and is actually more sting resistant. You will thank me come summer hive inspections. Finally, don’t go cheap on your gloves. You will want a sturdy thick glove, because bees can’t sting through some of the thinner materials. A final note: you will become the most popular kid on the block once you have bees. It’s a great idea to have one or two veils and sets of gloves for guests so you can do your very own hive tours! Comb stand: I have recently added these handy frame stands to my beekeeping arsenal. They hang on the side of your hive and allow you a place to hang a frame or two to give you some space to work in the hive, as opposed to leaning a frame up against the hive. I did the latter during inspections for a long time, but the practice does increase the chance that you may kick a frame, squish a queen, and if you have foundationless frames, new tender comb can fall out of the hive on a hot day if not kept perpendicular to the ground. (Wanna feel like a really horrendous beekeeper? Handle your frames carelessly and let tender comb fall and watch helplessly as the hard work of thousands of bees drop to the ground, wasting honey or perhaps even killing brood. The first time it happens is enough to make you wanna cry. Know that it will happen to you, as it has happened to almost all of us. Vow to be more careful, and carry on! If it was a frame of honey, move the comb at least 15 feet from the hive to prevent robbing and the bees will find the discarded comb and carry the honey back into the hive. Beebrush: I carry a bee brush in my truck and though I rarely use it, it becomes critical for those few times that I do need it. A brush is used to brush bees off a frame, your veil, or wherever else bees are hanging out that you’d rather they not. I recommend using the brush sparingly, as they do not enjoy a good brushing and will get agitated very quickly. If you have a frame covered in bees and you need them to move, a quick downward jerking motion of the frame will knock most of the bees off, and then you can use the brush to remove the few remaining bees. Hive stand: If you have read our blog on how to prepare your backyard apiary, then you know we recommend raising your hives off the ground at least 6 inches. You can use something as simple as 2 cinder blocks, build your own, or purchase a hive stand. If you have a top bar, a stand is not necessary as your hive will already be elevated on legs to waist height. Keep in mind you need one stand option for each hive, and remember that if you are building your own, the stand must be able to withstand several hundred pounds in weight, at least. I hope this helps guide you through those overwhelming catalogs. Stay tuned for more blogs soon to help you prepare for your spring bees! Here at Two Hives, we specialize in helping urban beekeepers get started. While the basics of beekeeping are the same whether you are in the city or on a 20 acre farm, urban beekeeping does have some special considerations. Over the coming months we will be writing a series of blogs geared towards brand new beekeepers! In this, our first in the series, I an answering the most common questions I get that pertain specifically to wannabe (wannabee!?) urban beekeepers looking to place bees on rooftops and small garden plots. Will my bees have plenty to eat? You may be surprised to hear that my urban bees here in Austin do just as well, or even better, than my hives on more rural plots outside the city! The reason? Landscaping. (I’d also be remiss if I failed to mention that Austin is a city full of folks that value herb and vegetable gardens over “useless” manicured lawns.) Keep in mind bees will forage up to 3 miles for food (or 5, depending on who you ask). But if they don’t have to travel that far, they will be more productive and conserve more energy overall. Take a look around your neighborhood. Is yours one full of rose bushes and well tended grass, or is it more common to find gardens, vines, and native blooms? If it’s the latter, your bees may be well taken care of. I preach that your bees are ultimately YOUR responsibility to feed, and I’m not talking about sugar water. Unsure about what to plant? Check out this blog to learn a bit more about how to select bee friendly plants for your yard. I wasn’t born with a green thumb (a yellow one perhaps?) but I focus on hardy herbs such as rosemary and sage and plants native to my region to help ensure my success. Think of plants that bloom outside of your region’s main growing season to help extend your bees’ forage calendar. The Lady Bird Johnson Wildflower Center’s website has an extensive database of plants that are of special value to honey bees. Filter by those native to your state, plant type, bloom period, light requirement and more. For my Texan beekeepers, if even that is too much trouble, check out these Texas native seed mixes. I have chickens/dogs/kids. Surely they can’t coexist harmoniously!? Let’s take these one by one. Chickens: I have seen no reason to have concerns about chickens, and several of my hives are a mere few feet from chicken coops. Chickens have been known to eat dead bees, and if you choose to employ the practice of drone culling to control for varroa mite, chickens love to eat larvae! Dogs: Generally speaking, dogs likely pose more of a concern to individual honey bees than the other way around. For some reason most dogs love to try to bite honey bees out of the air! Of course, if a dog chooses to stick his nose in the front of a hive, the bees will quickly educate him that he is invading their space. Most dogs are quite intelligent and will learn to not stick their nose where it doesn’t belong twice. If you are the owner of one of those precious “all brawn and no brain” animals, you may want to build a sort of barrier to keep him from sniffing around the entrance. Kids: Tending bees is a phenomenal hands-on learning experience for kids, and I highly recommend you involve your kids in the process from the very beginning. We provide hive tours and special kids classes here in Austin, and hopefully you can find something similar in your area. Plus, few things are more adorable than a kiddo in a bee suit! I bet you all have a stove in your homes, and you assuredly have taught your kids that the stove is off-limits and not to be touched. Employ the same thought process to bee hives and teach your kids the hives are not to be disturbed without adult supervision. Generally speaking, a kid can get a few feet away from a hive with few repercussions, but ensure they know they should never stand directly in front of an entrance or open the lid. These two score off the cuteness charts! Is my yard even appropriate for bees? First things first—you need to learn if keeping bees in your city is legal. While urban beekeeping has become quite vogue in cities such as Brooklyn and L.A., plenty of cities still don’t allow beekeeping in the city limits. Find out the regulations in your city, and follow them to a T. Most will prescribe a certain hive density to your plot size, and may require you be a certain number of feet from your neighbor’s property line. Even if regulations are lean, I recommend you place your hives, at a minimum, fifteen feet from your neighbor’s property line. If you are any closer, consider installing a sort of barrier, such as a small fence or a line of foliage (vines, bamboo, etc.) If you or your close neighbors have a swimming pool, make sure you place a water source for the bees within 5-10 feet of the hive. Honey bees love swimming pools, and once they establish a preferred water source it can be almost impossible to break them of that habit. Some swear by adding a few drops of lemongrass essential oil to your water to draw the bees to that particular source. Keep in mind bees drown very easily, so stones, corks, or a type of float is important to include. Want to learn more about the specifics of preparing your yard for bees? This blog will help you get your site prepped for bees. A quick note on rooftops: rooftop hives are great for so many reasons. First, we know bees prefer to be higher and away from the commotion. Second, you generally don’t have to fuss with trimming grass or ground cover, and down here in the south, that can meet no small hive beetles, which pupate in the soil. However, one word of caution: think about your roof access. Climbing a ladder isn’t too bad until you have to carry a 45 pound super of honey along for the descent! My yard is pretty small. Don't you need a lot of land to keep bees? There are two parts to this question. First: how much space do the actual wooden hives take up? Presuming you are doing langstroth hives, the footprint is pretty small. The boxes are only about 14"x20". A top bar hive takes up a bit more space and can vary from one manufacturer to another. Our top bars are about 48"x18". Multiply those numbers times the number of hive you plan on keeping Of course, you need a few feet on at least one side of the hive to stand to work, and I prefer to have a few feet on the back side to maneuver as well. The second part to this question involves how much space do you need to allot around the hives as an 'off-limits' zone where you would refrain from working or playing. This is a very personal question and pertains to your comfort level. However, I feel completely comfortable letting my nieces and nephews play within about 6 feet of the hives. I would provide additional space in front of the entrance to the hive, as you never want to block the forager bees' flight path. But what will my neighbors say? If you have ensured you are within your legal rights (see previous question!) then your neighbors can complain, but probably to no avail. I get asked often if you should warn your neighbors before you start hives. No, you should not warn your neighbors. However, unless you are concerned the conversation will head south quickly, I strongly encourage you to share the wonderful news that you are embarking on such a fun adventure. If your neighbors are gardeners, they likely already know the benefit of bees, but it doesn’t help to remind them. (A quick anecdote: my first urban site partner saw four times the yield in his garden the first year we installed the hives.) Do your research and educate yourself, and then find ways to share the experience that will resonate with your neighbors, even if its just with a bit of honey from your first harvest. If they are particularly nervous, I’d strongly recommend you ‘mask’ the hives in some way. My experience is that the old adage is true: out of site, out of mind. Building a small trellis with some beautiful vines in between the hives and the neighbor is one idea, and clumping bamboo also provides a nice privacy screen. Of course, if a close neighbor shares that her daughter is deathly allergic to honey bee venom, I’d strongly suggest you find somewhere else in town to place your hives. While you likely can’t be liable and no one could prove it was your honey bees if she were to get popped, I doubt that guilt or hassle is one you want to be burdened with. Still have questions? Let us hear them! A version of this blog first appeared in the October 2016 Kelley Beekeeping newsletter. Tara writes a bi-monthly column on urban beekeeping entitled "The Townies." You've taken the classes, read the books, bookmarked all the blogs, and ordered your packages or nucs. Before you pick up those bees, check out these tips on how to ensure your site is prepped and ready for your bees! I've made some poor decisions in site selection over the years-don't repeat my mistakes! This is likely counter to what you’d assume, particularly here in hot Texas. However, the small hive beetle—a nasty little pest that loves to wreak havoc on hives—pupates in the soil. Giving your bees mostly full to full sun will ensure those babies just bake and is good integrated pest management. You aren’t going to want to weed-whack near your hives (trust me.) If you can select a spot where tall grass and weeds won’t grow, that is easiest, but if not you may want to consider adding mulch or stones around your hive to ensure you don’t have to battle tall grasses to access the hive. I have one site where this just isn’t an option, and every month I get my workout with my sythe in hand. Though you don’t need to get out the level for this exercise, as close to level as possible is ideal, particularly if you have a top bar or aren’t using foundation in your langstroth. You may want to have the ground tilted slightly (emphasis on slightly) towards the entrance to allow any water that may collect to run out easily. If your hive is a top bar, your hive will likely come equipped with legs or you have already figured out what to set it on. If you have a langstroth, I recommend you raise your hive at least 6 inches off the ground. In the spring of 2015 we had biblical rains here in Central Texas, and those few extra inches saved a lot of colonies from drowning. Additionally, it can deter some other pesky pests as well. Cinderblocks work perfect for this—one under the front of the hive and one under the back and you are ready to go! Speaking of cinder blocks, make sure your ground is fairly solid and won’t shift too drastically. A semi-soft earth, very heavy cinder blocks, and those same 2015 rains caused many of my hives to shift and sink a bit into the ground. Not too difficult to fix, but can be avoided. Bees need water for more than just their own consumption, it also is used to help cool the hives (think evaporative cooling) and to dilute crystallized honey. Bees will collect from lots of places, including puddles, condensation on plants, and damp rocks. However, they will also collect from places you may not want them, such as your kiddie pool, your chicken feeder, or your neighbor’s new swimming pool! To avoid your bees collecting in places you’d rather they not congregate, give them an appropriate water source within 10 feet of the hive. You want to do this before they establish a preference elsewhere! Keep in mind that bees drown very easily, so make sure to place floats, such as corks or sticks, or stones in the water. Interested in learning to keep bees? Check out our group classes and private lessons or contact us to create a custom package that fits your unique needs!